I like using non-traditional colours and colour combinations for Christmas, so I thought I'd give this combination from Dynamic Duos the Christmas treatment. Actually, tangerines are Christmassy - when we were kids it was the only time we saw them, in the bottom of the Christmas stocking! Fortunately there were no olives in the bottom of the stocking, I couldn't have eaten them as a kid, but I love them now. The stamp image and sentiment is from Clearly Besotted Stamps (don't forget to comment on Steph's blog for some fabulous blog candy - it's a wordlwide offer), and the background paper is Madison from Penny Black. Beautiful! Love the ruffled ribbon treatment off to the side...and it's such a gorgeous color! Thanks for playing along with us at CASE Study! Fab card, love that color combo! Thanks for joining us at CASE Study! Love the pop of orange! That background paper is divine....I love everything and anything plaid! Really lovin' these non-traditional Christmas colors! I've been watching the Clearly Besotted Stamps and the one that you have is at the top of my wishlist! I love how cheerful it looks with tangerine and olive. 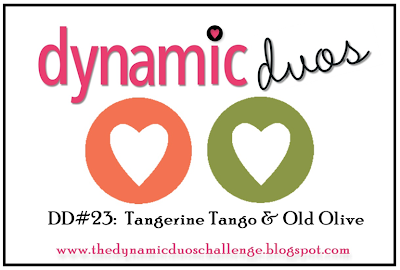 So glad to see you at Dynamic Duos! Great card and CASE Shirley. Love these colors on your holiday card! That ruffled ribbon is a gorgeous addition! :) Thanks for joining us at Dynamic Duos!